Half the day was spent in Lake City today. It’s amazing what a good night rest in a comfy queen sized bed and a soak in a hot tub can do. I had iced and then heated my thigh last night and woke up to it feeling much better. I still feel it a bit and will be careful this leg not to aggravate it by keeping a shorter stride and not putting full force on that leg. It has been nice to be in town with Rockin’ and Silly Chili. It is a smaller group and nice to only have three in a hotel room. The three of us are also on the same wavelength in town because we are all busy online trying to get caught up on things. Rockin’ and I with our blogs and Silly Chili with his online classes. We are all fairly quiet and focused and that helps my “wired” stress level which was through the roof in Silverton. I now feel like I caught up and got much of the things done that I had fallen behind on. The zero in Salida at the end of this week is one we are all looking forward to! As for today, I opened my resupply and had gotten gifts from a few people I want to thank. Thanks to Linda, Edie, George, Katy, Chad, and Mule! The goodies and Mountain House dinners are awesome!!! Beacon took us to the trailhead to start hiking around noon. Right went we drove up, Sunday was in the parking lot having just finished the previous leg. It is funny because that is the fourth time that Sunday has literally walked off the trail as I am just leaving to start the next leg. It happened at Doc Campbell’s, Pie Town, Cumbres Pass, and now here! For this leg, Silly Chili is going to push ahead to get to town a day ahead of us because he needs to get a TB test for grad school and has an appointment at the Salida health clinic. 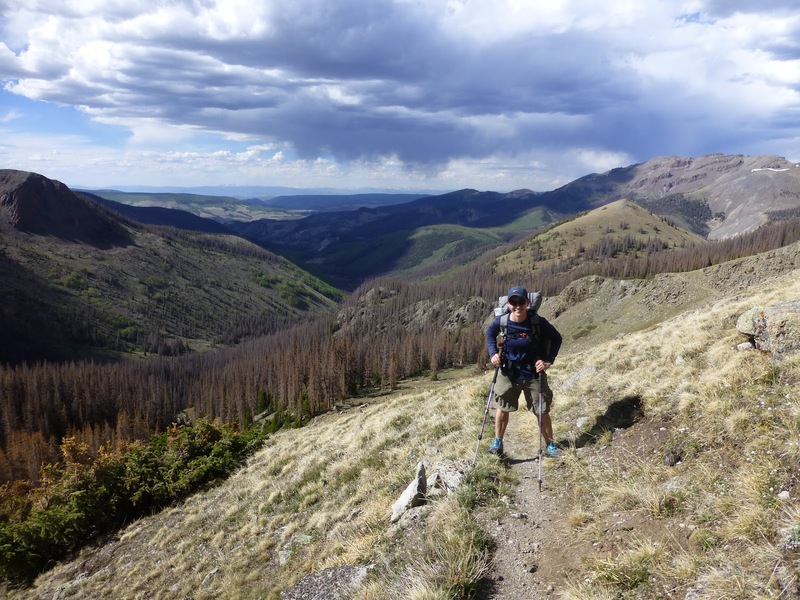 It is Silly Chili’s first time doing any backpacking solo (he is 22yrs old) and it was like watching a son go off to college. He was really pumped and excited to see how much he can do on his own because he is speedy and full of energy! I think he’s going to absolutely love it! As soon as Beacon drove away, I noticed I had left my iPhone in his car. ARGH!!! It was made even worse by the fact that on the last ride to trail two days ago, I managed to leave my solar charger in Wiffer’s car and she had to mail it to Salida (our next town) for me. Do I not learn anything from my mistakes!? I was so pissed at myself and the only thing I could do was wait for Beacon to hopefully come back to the pass with the next group of hikers, which was to be the rest of the crew. Since we had a lot of uphill, Rockin’ and I agreed that she’d hike ahead and that I’d catch up. I didn’t have a watch, but I’m pretty sure I waited at leasr an hour and a half for the next carload to arrive. It drove me nuts! I made good use of my time and was finally able to sew my pants which fully ripped and split open on the inseam when we went over a cornice last week. About an hour into my wait, the couple Bloodbath and Rampage came off the trail ready to go into town. There was no reception at all at the pass, so we just waited together for Beacon. I last saw them in town about 6 days ago, so it was nice to catch up and talk about our experiences with the last leg. After waiting 1.5hrs two carloads arrived with 10 of the hikers from town. Many of whom are are new herd for me because I have caught up to some who were injured, section hiking, or started a couple weeks ahead of me. The 10 hikers were LoveNote, Stryder, Drop-N-Roll, Ninja, Sweetfish, No Amp, Bone Lady, Cheese, Bow, and Cherry Picker. Of course they were quite amused to find that I had lost what is almost my identity out here! I got my phone and hustled ahead to catch up to Rockin’. Today started with a quick 1,200ft climb back up over 12,000ft. I was feeling great and cruised not even feeling like I was in high elevation. 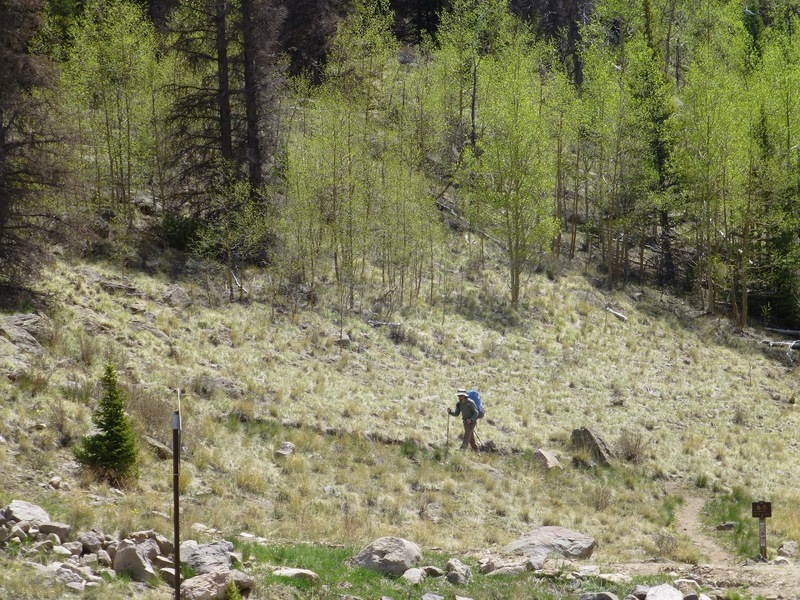 The trail was great after the initial ascent through a forested area. 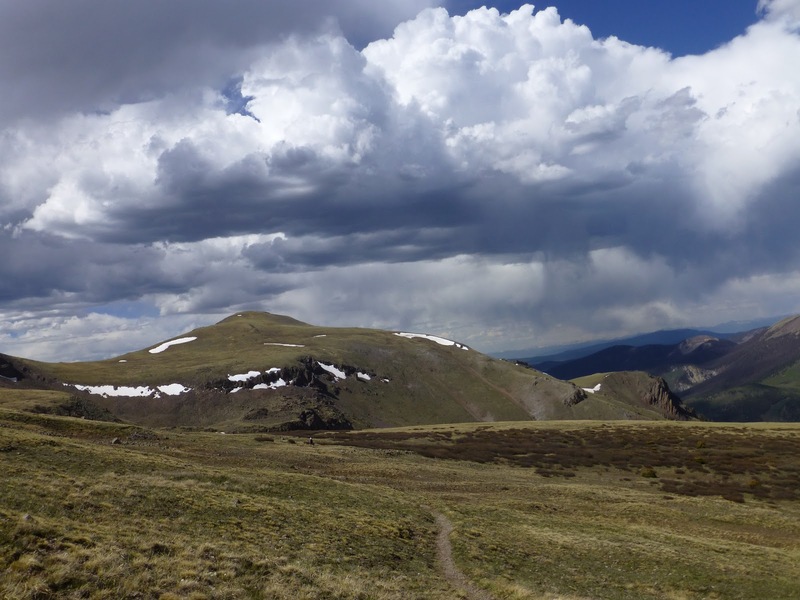 The trail meandered in a very open field known as Snow Mesa and with the clouds it was just amazing! The rest of the day, the trail continued to gently roll and weave. We had different scenery than we’ve had thus far and it was great to just take it all in. It was a great day! We had one final steep climb that went straight up and planned to camp at a creek on the other side. It was one heck of a climb and Rockin’ is still adjusting to the elevation, so I stopped early when I saw great camping in the trees near a stream after the climb. By the time she arrived, I already had my tent up and water ready to boil for her homemade dehydrated dinner. We are sharing a stove this leg so Silly Chili can have theirs. The rest of the crew (LoveNote, Ninja, Drop-N-Roll, Stryder, and Sweetfish) came by about 30mins later and chose to hike another mile or so further to the next creek. It’s fun to overlap with them on these legs and since we get up early, we will see them again by lunch tomorrow. Rockin’ and I are very fond if this campsite. 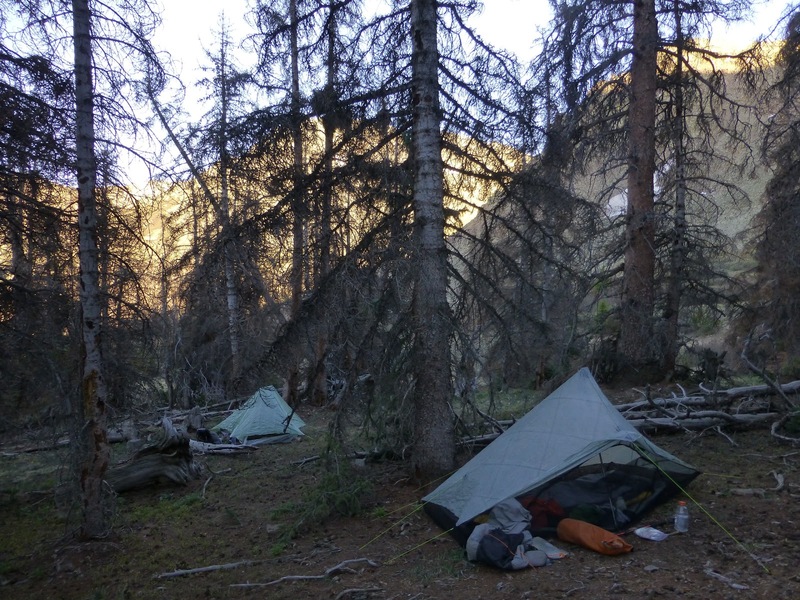 We are over 12,000ft, but sheltered in the trees and the weather is remarkably mild and probably in the 40s which is perfect for camping! There are some beautiful mountains just behind us too! It is also our most relaxed night as Rockin’ arrived by 6:15pm. We are just both so content and comfy! We looked ahead to tomorrow and noticed a climb, but then down below 10,000ft for the second part of the day, wow! We are really looking forward to that!